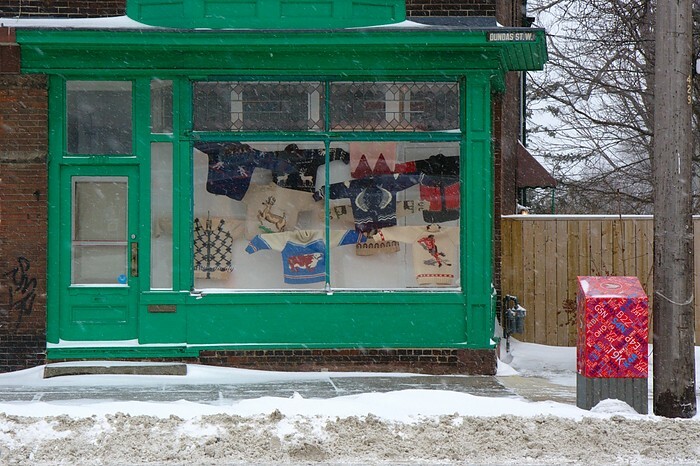 Dundas West: Hipster Sweater Shop? February 2, 2011. 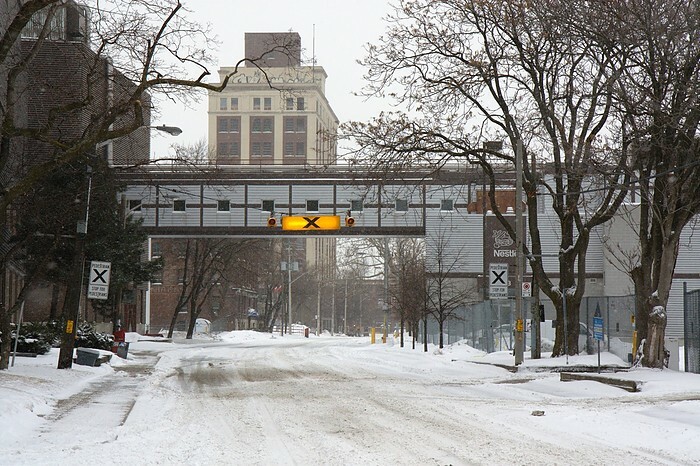 Dundas St. West at Parkway Ave. (between Howard Park and Sorauren). 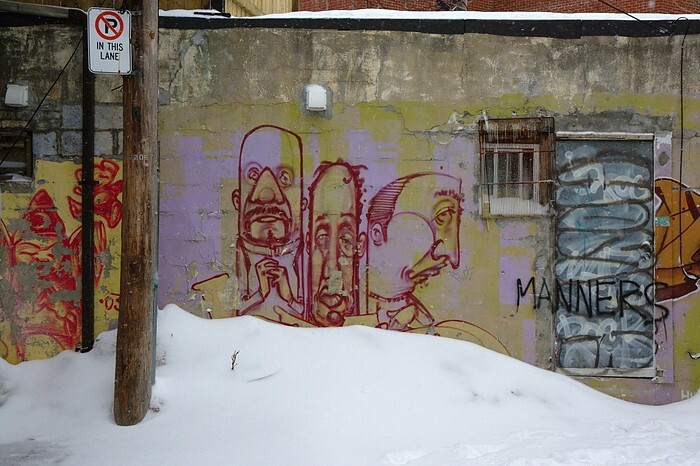 February 22, 2011, in a laneway off of Herman Ave. behind the Loblaws near Dundas and Bloor. February 2, 2011. 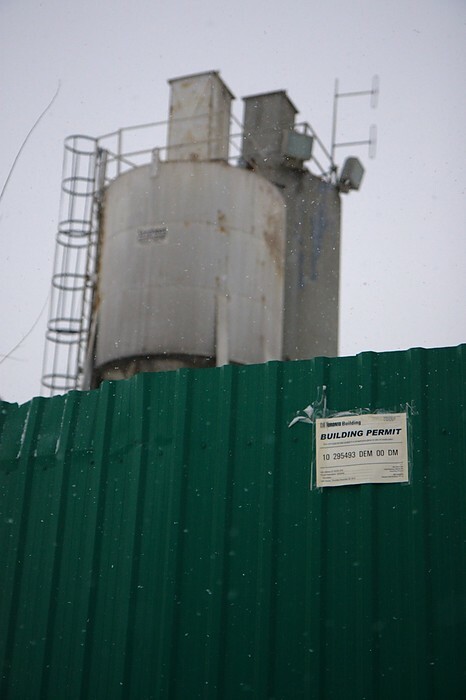 The Ontario Redi-Mix plant on Wade Ave. near Bloor and Lansdowne is being demolished. February 2, 2011. 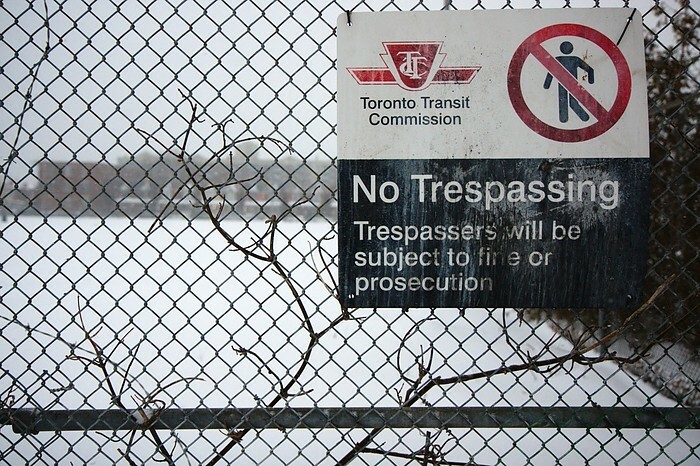 No Trespassing sign on the north side of the former TTC streetcar barn land on Lansdowne Ave., north of Bloor St.
February 2, 2011. Bloor Street Fitness, on Dundas St. just south of Bloor. 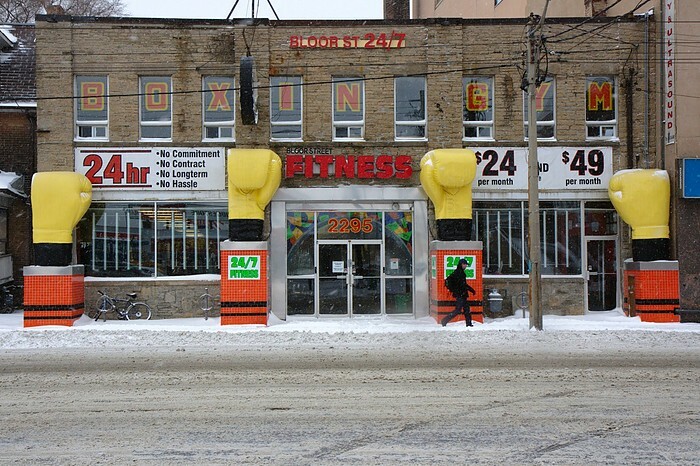 This is one of my favourite storefronts in Toronto, though I liked it better when the boxing gloves were still painted red. I took this photo during the over-hyped "Snopocalypse" on Wednesday morning while taking an extra-long walk to the subway. February 2, 2011. 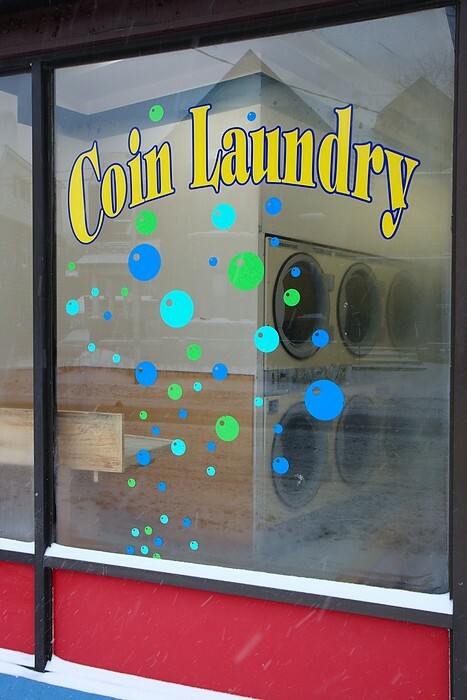 I call this place the "Death Star Laundry", on Lansdowne Ave. just south of Wallace Ave. Notice the resemblance? February 2, 2011. 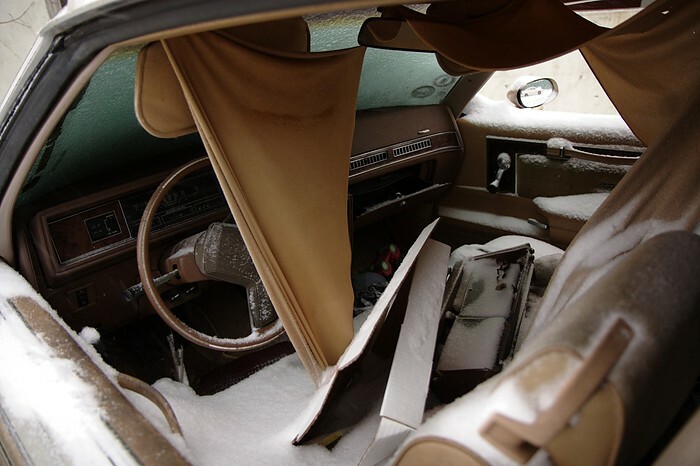 Toronto is currently in the icy grip of a major snowstorm. Fear the snow! Stay in your homes! Schools are cancelled! Being a brave soul, I risked life and limb to explore the destruction. Miraculously, I survived and came back with some photos. And then I went to work like any other day, without any delays. Meh. Photo taken in the junkyard on Wade Ave. near Bloor and Lansdowne, Toronto. January 8, 2010. A followup to my previous post. 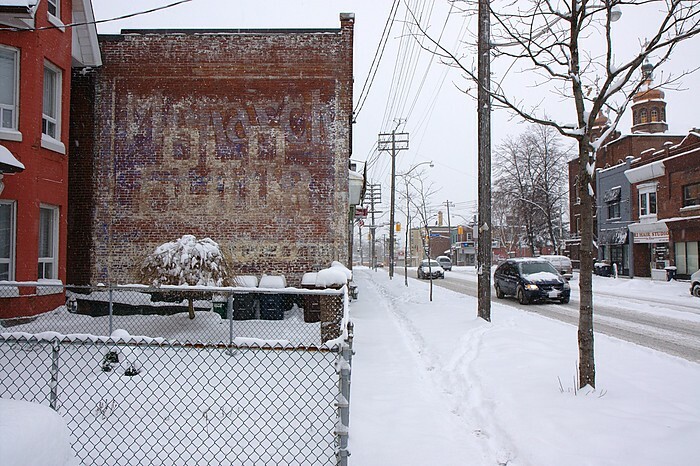 This is an old painted mural sign on the side of 1607 Dupont St., in the Junction Triangle, Toronto. If you look closely, you can make out what appears to be two old signs painted on top of one another: Old Dutch and Monarch Flour. I wasn't going to post this one to my blog, but the previous post generated some discussion on Flickr. January 8, 2011. 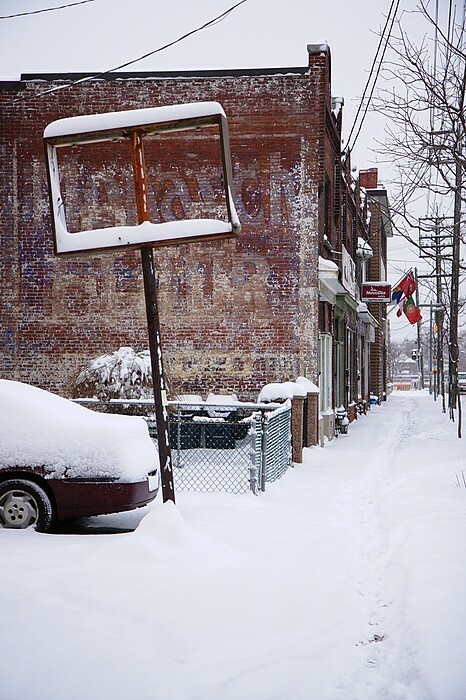 A couple of old signs on Dupont St., looking west between Franklin Ave. and Edwin Ave., south side.